Is innovative IT acquisition all in your head? What makes an ideal shared service? Is a Senate-Confirmed Federal CIO the Key to IT Reform? Can Big-Data analytics better secure DoD networks? Los Angeles: The Beginning of Nationwide Wi-Fi? The last two months of fiscal year (FY) 2014 are nearly upon us and that puts us on the cusp of the height of the 4th quarter (Q4) “federal IT busy season.” Even with several disruptions that have marked the first half of FY 2014, agencies do have budgets in place and are spending. If historical averages hold, several agencies will spend more than 50% of their FY 2014 contracted IT dollars in Q4. 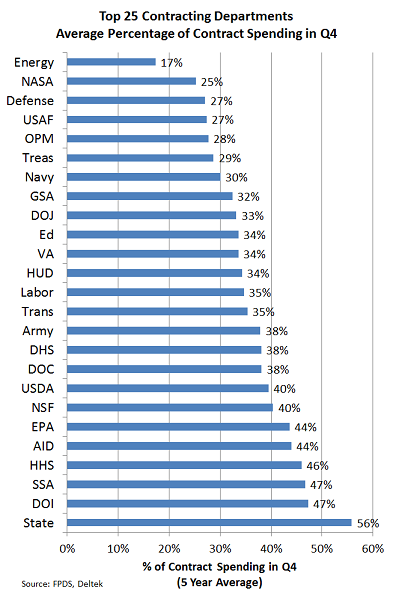 From FY 2009-2013 federal departments reported spending an average of 32% of their yearly contract dollars in the fourth quarter across all spending categories. However, the percentage of Q4 IT contract spending was 39% among the same departments for that period. Agencies tend to buy more of their IT in Q4 compared to other products and services, on average. Translating that into dollars, over the last five fiscal years federal agencies spent an average aggregate of nearly $30 billion on IT hardware, software, and services in Q4 alone. This is the case based on historical spending data, even in the era of sequestration and other budget constraints. Which departments are the best targets for a firm’s Q4 IT capture efforts? Over the last five fiscal years the following 25 departments or agencies reported the largest overall contracted IT spending and make up 99% of the federal market. The chart below shows their average contracted IT spending in Q4 over the last five years. Sixteen of the 25 top-spending departments will spend an average of 40% or more of their yearly contracted IT dollars in Q4 (and several more departments are not far behind in percentage points.) Those 16 departments account for an average of $20 billion in combined Q4 IT contracts from FY 2009-2013. 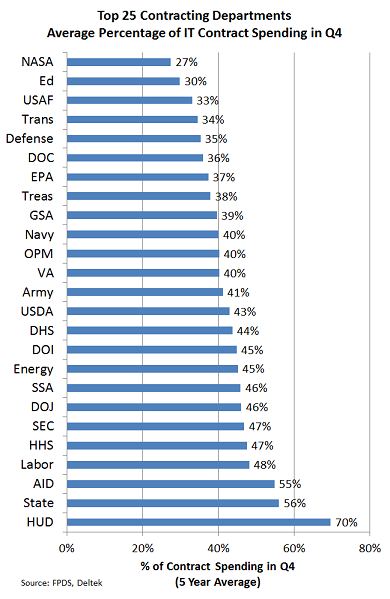 Not far behind, the departments that spend between 45% and 48% of their yearly IT contract dollars in Q4 – like HHS, DOJ, SSA, Energy, and DOI – tend to have even larger IT budgets. These five departments account for a combined average of $3.2 billion in Q4 IT contracts over the last 5 fiscal years. Much of these contract dollars will flow to commodity IT products like software and peripherals, but significant dollars will also go toward IT services. Proposals that were submitted weeks or months ago may come back to the foreground for potential action and companies that can quickly turn around competitive quotes for their federal customers may have a chance at stealing business from incumbents. With FY 2014 getting a bit of a slow start due to delayed budgets and agency shutdowns, the rebounding we are seeing in the second half of the year may result in a record-breaking Q4. We will have to wait and see. Last week’s post provided a brief analysis of spending on cloud products and services procured through four Army-specific contract vehicles. This week expands the view a bit to examine spending on cloud services through the General Services Administration’s massive Alliant Large and Small Business Government-Wide Acquisition Contracts, or GWACS. Since their inception in fiscal 2009, federal agencies have obligated more than $8.6 billion for IT services through the Alliant GWACs. Procurements for cloud services over that time span total more than $199 million (2.3%) of this spending. Two-plus percent isn’t a lot of money in the grand scheme of things, but it is a significant start considering that the broad adoption of cloud services by federal agencies didn’t really begin until fiscal 2011. Nit-pickers are asked to keep in mind that “broad adoption” is a relative term used here to denote growth in government cloud spending from practically nothing in FY 2009 to nearly $1 billion overall in total awarded contract value in FY 2011. Returning to spending on cloud services that has gone through the Alliant vehicles specifically, the chart below provides a look at the available data sorted by fiscal year. As we can see, spending on cloud services jumped significantly in fiscal 2011, establishing a pattern of overall higher annual spending per year that continues to this day. In fact, with data for the Department of Defense still trickling in for Q2, it looks like fiscal 2014 will end up seeing the highest spending on cloud services ever through the Alliant vehicles. This spending breaks down as follows in the large vs. small business contracts. Surprised? I was. The talk in industry circles holds that government customers often issue market research for cloud procurements to Alliant large businesses and then compete the respective contracts to Alliant small businesses. The chart above demonstrates, however, that much more money goes through the Alliant Large Business vehicle than Alliant Small Business. How did this spending break out by agency? As the chart below shows, both Defense and Civilian market sector customers make use of the Alliant GWACs. The EPA’s spending here is the Central Data Exchange (CDX) program, which is in the process of integrating cloud computing concepts and strategies to gain operational efficiencies, reduce costs, and increase agility. Finally, slicing the data by vendor, we see that CGI Federal has been the biggest earner on Alliant. This isn’t surprising given that it is the prime for the EPA’s CDX Program. An interesting trend worth nothing is the weighting on the chart of large vs. small businesses. The top six vendors on the left of the chart are all large businesses while ActioNet, Phacil, Quality Technology, SBD Alliant, Janus Research Group, and AAC are all Alliant small businesses. Intermingled with them are Booz Allen Hamilton and Verizon, which owns Federal Network Systems. So, what does this data tell us? It says that cloud spending on the Alliant GWACs is growing. In this sense it mirrors overall growth in the procurement of cloud services across the federal government. When compared to other data on the cloud market that FIA has provided elsewhere (see our Report on Cloud, Data Center Consolidation, Big Data, and Mobility), the Alliant data also tells us that agencies are relying on Alliant to procure cloud services in conjunction with several other acquisition approaches, including unrestricted and GSA IT 70 competitions. In short, striving to position cloud offerings on GWACs like the Alliant II follow-on should be part of every vendor’s business development strategy. Federal customers will look to Alliant II for the cloud solutions they need. The question is will your company be positioned to compete when they come knocking. A new player in federal IT? Security automation: Are humans still relevant? Can 28 nations collaborate online? Cost Savings from IT Reform Are... Nil? Would Bringing the SSA into the 21st Century Kill 300,000 Jobs? IT Success: Just What Defines It? Federal Fourth Quarter FY 2014 – Who’s Got the Money? It’s that time of year again in the federal contracting world – the final quarter of the fiscal year, i.e. the Q4 “busy season.” After a rocky start to FY 2014, marked by budget impasses, shutdowns, continuing resolutions and sequestration, contracted spending appears to be catching up and may be on track for a record fourth quarter. Some federal departments will spend more than 40% of their contract dollars in the next few weeks. Due to the topsy-turvy environment over the last few years taking a bit of a historical perspective on spending may help to get a sense of what is likely in store for this Q4. According to their FPDS reported contracted spending over the last seven years, federal departments spent an average of 43.4% of their yearly discretionary budgets with contractors. Applying that percentage to the enacted FY 2014 discretionary budget of $1.127 trillion means over $489 billion in contract spending would be spent in all of FY 2014. Further, from FY 2009-2013 federal departments reported spending about 32% of their yearly contract dollars in the fourth quarter. That means more than $156 billion of FY 2014 contracted spending is likely to be obligated in the last 12 weeks of the fiscal year. Given a slow start in Q1, the actual Q4 amount could be billions higher as agencies work to catch up. So which departments and agencies are most likely to have big money to spend between now and the end of September? Looking at total contract obligations over the last five fiscal years, the following 25 departments reported the largest overall contracted spending and make up 99% of the market. The chart below shows their average contracted spending in Q4. Eight of the largest departments on average spend at least 40% of their contract dollars in the last fiscal quarter and the State Department averages nearly 60%. In average dollar amounts, the Army, Navy, Air Force and DoD will have the most to obligate. From the civilian side HHS, VA, DHS, Energy, and State will be the biggest Q4 spenders. Contractors need to be well-prepared to meet the needs of their federal customers to effectively and efficiently get these contract needs met by being highly responsive and by providing compelling proposals and bids. The dollars will flow, but where they go may be still up for grabs. The National Security Agency (NSA) Central Security Service (CSS) Center of Academic Excellence (CAE) programs support the President's National Initiative for Cybersecurity Education (NICE) in growing the base of skilled workers capable of supporting a cyber-secure nation. Mid July 2014, NSA recognized five schools as additions to the Cyber Operations Program. The University of New Orleans (Louisiana). The additions bring the total of schools in the Cyber Operations program up to thirteen. NSA’s Centers for Academic Excellence include programs addressing Cyber Operations, Information Assurance Education, and Research. The Information Assurance Research and Information Assurance Education, jointly overseen by NSA and the Department of Homeland Security, boast over 100 existing centers of academic excellence. While the Cyber Operations program is “designed to cultivate more U.S. cyber professionals,” it’s not clear whether these individuals are expected to bolster the nation’s information security from within government ranks. While students may consider the CAE designation in evaluating schools, they might have their sights set on the private sector. Students participating in the Cyber Operations program will have opportunities to pursue summer internships at NSA, which suggests that there is hope to bring in new talent. Considering the workforce challenges agencies have faced in recent years, it’s questionable whether that’s where students will head. When it comes to information security personnel, federal agencies have struggled with recruitment, retention, training, and hiring system complications. Although the most recent FISMA report did not include data on security personnel, the FY2012 FISMA Report indicated a continue reliance on skilled personnel. Workforce amounted to approximately 90% of FY2012 IT security costs. Within civilian agencies, around 42% of the FTEs with major responsibilities in information security were contracted roles. Defense agencies managed to fill 68% of those information security roles with government employees, but they still relied on contractors for nearly a third of the workforce with information security responsibilities. It’s clear that agencies will need contractor support for the foreseeable future. At the same time, the current fiscal environment casts this cost structure in an unsustainable light. Perhaps, the more realistic expectation for these academic programs is simply to serve as incubators for cyber talent. In the long run, both industry and government (often through contracted support) stand to benefit, and continued government-industry collaboration will help improve our overall cybersecurity posture adapt to future threats.